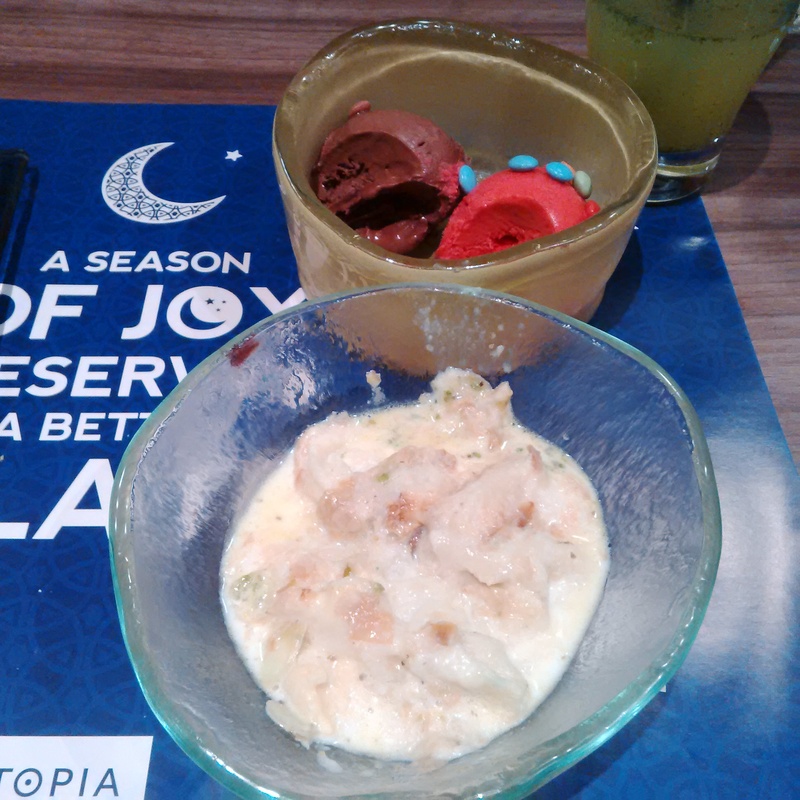 Zomato‘s first Iftar Foodie Meetup was held at Eatopia in the Gate Mall. When I first experienced Eatopia, I was a bit taken back, confused by the concept and didn’t think I’d come back. Than I was invited to my first Zomato Meetup back in April where everything was explained to me by the friendly staff and management. We had such a blast, I’ve been coming back every since! However, this was my first time experiencing Eatopia during Ramadan. I must say, it was one of my best experiences yet at Eatopia! Here’s why. First off, you need to understand the original concept. As you step in on the 2nd floor of the Gate Mall, there is a vast entrance with the left leading you to the restaurant and the right leading you to the oh so sweet shop/deli. As you walk into the restaurant, you’ll see multiple stations, starting with the dessert section on the right, salad and sushi to the center, than coming around to the left to find the Arabic, Italian and Western sections. After you select your seat and order your drinks, you then take your order card that’s assigned to you and make your way to your section of choice. Whatever you order is than scanned onto the card and you can take a seat while it’s made than delivered right to your table. For example, get your salad, scan, walk to the Italian, order your fresh made pasta, scan, order a shawarma because you can, scan, have a seat and everything comes to your table. Once done, you take your card to the cashier, make your payment and walk off your food coma. During Ramadan, Eatopia basically has the best of both worlds, a buffet of all it’s goodness set out with the cooking stations still going strong. How sweet is that idea? So I was given a quick tour of what to expect by the lovely manager, Ms Marifel, showing me the addition of a juice bar, where we can get our popular Ramadan drinks like lemon mint and cold karkadeh (hibiscus iced tea to the rest of you) along side all their popular stations, most with ready made food laid out plus your option to get a made to order dish. As the Foodies gathered round, I gave them a quick explaination and as soon as it was time to break fast, we were off. Eatopia had generously laid out water and dates for us at the table so we can traditionally break our fasts. I started with the salad section where I made my selection and a helpful staff added in the dressing of my choosing. Afterwards, I was anxious to get my hands on a Penne Eatopia, my favorite dish at Eatopia, period! Because it was buffet style, they made the next closet thing to their menu item which was penne pasta with mushroom and “pink sauce”, a lighter version of the typical tomato marinara sauce. It was still so good and the portion was just right, you could go for seconds on your choosing. However, I ended up trying their pizza for the first time and I almost went back for seconds! Cheesiest, thinnest pizza I’ve had in a long time! That was pizza my friends, right there! Bruchetta came in three forms. Your original, your duck breast and your two in one. I tried the original and the duck breast which was highly recommended by Ms. Marifel and it was sublime. So good, I went looking for her to thank her for her recommendation! Two bowls of goodnss, Umm Ali and ice cream! Of course, must end such a heavy weighted iftar with dessert. I hadn’t tried most of their desserts as I’m usually always too full but yesterday, I was ready and determined! Everything offered looked so good. I had a few pastries, a small helping of Umm Ali and two scoops of ice cream, one chocolate (of course! ), one raspberry. Umm Ali was simply divine, and I mean someone actually did it right for a change. It’s such a popular dessert for Ramadan yet it’s either too dry or too much coconut, yuck! This was balanced and literally perfect, I could’ve licked my bowl clean. Then I went for the ice cream and it was seriously one of the best I’ve ever had. I need to go back and find out where they got it from or if they make it themselves because it was seriously that good. I mean, G.O.O.D.! If you like fresh and variety, you’ll LOVE Eatopia for iftar this Ramadan. Seriously, (and I don’t care if it sounds cheesy) I believe the reason the food is so good is because it’s made with love. Not a single staff is without a smile, anxious to give you the best experience possible. For just 135QR per person, you get an iftar of great food, accessible parking and 5 stars service! Suhour is also served starting at 9pm which includes a live band. I recommend calling for reservations in advance, especially on weekends. Don’t for get to check out the shop and get your receipt for discounted parking.